There will be no more "winter is coming" warnings; the end of MLB's 2013 season means winter has come. For those who are already starved for baseball, there is the option to turn one's eyes to the "Land of the Rising Sun" as there is at least a one more game left to play in deciding the next Japan Series title champions. As of now the Ratuken Eagles are up 3-2 in the series against the Yomiuri Giants. While the Giants have competed in the Nippon Professional League since it's inception in 1950 (and since 1934 as part of Japan's Independent League and the Japanese Baseball League) the Eagles have only been around since 2005. The Giants - along with the Hanshin Tigers - are the most known and profitable teams in Japanese baseball so it's nice to see a newer team like the Eagles contending with these heavy hitters. As a San Francisco Giants fan, it seems unfitting to root for any team other than one called the Giants. 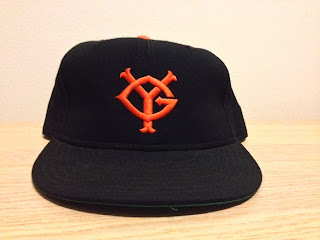 Even though there is no affiliation between the Giants from the United States and those of Japan, it would be unthinkable not to have a Yomiuri Giants cap in my collection! Being a San Francisco Giants fan can be tricky in New York City and it's fortunate that we have Finnerty's, a San Francisco Bay Area sports-centered bar in the East Village. Outside of this great establishment though, wearing a SF Giants cap around NYC can raise eyebrows at times. 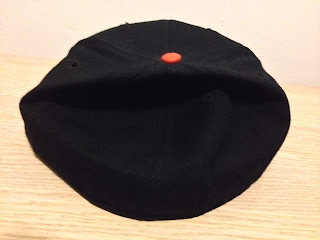 I personally think it's a wise decision not to draw too much unwanted attention to yourself in this city and this Yomiuri Giants cap will definitely help you fly "under the radar" most effectively. I imagine wearing a Yomiuri Giants hat around in Tokyo has a similar "blending-in" effect as rocking a Yankees cap around Manhattan so I think this cap does a good job of getting the right people to notice you here in the States. 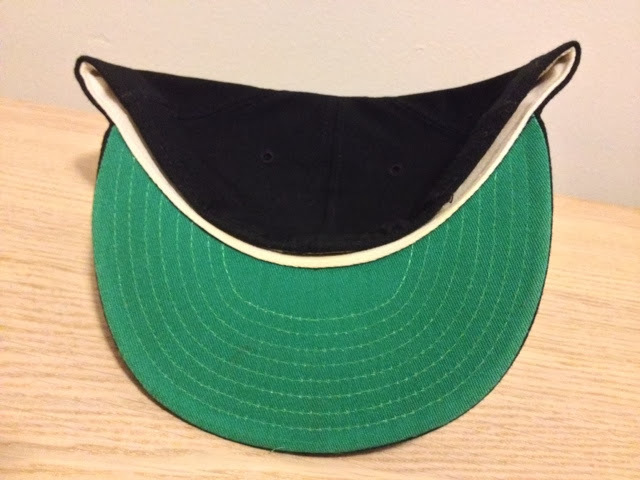 Actually, I have no idea what the fitted hat culture is like in Japan but I'll just pretend like I know until I get properly educated on the subject! 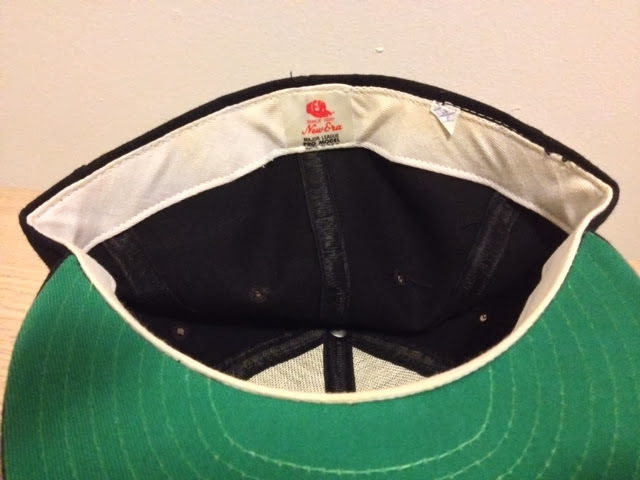 Judging by the lone New Era tag on the inside of the cap, I'd say it is from the late-1980's or mid-1990's. I'd hesitate to say 80's because the sweatband is white (and not leather) but I would be careful about how far into the 90's because of the green underbrim. Also of note is that the size tag is all but torn off; all that remains is a small bit where "7 3/4" is scrawled in minuscule writing. You won't find any League logo embroidered on the back of this cap but I've noticed in recent photos that the Yomiuri Giants caps now feature some sort of rear-logo. I wouldn't mind that being the case inasmuch as it makes this older style of cap all the more special because it's not there. I'd be into picking up one of these recent caps with the rear-logo, especially if it came with one of those sweet Japan Series side patches! Now that is a cap worthy of Holy Grail status.